My (small) experience with Arch and different environments | goFLOSS! This is a quick note to share my short experience with Arch so far. I wanted to set up a small audio station, using an oldish netbook (Dell Inspiron mini 10). I thought I’d give Arch a go, for the interesting install process, and to ideally have a minimal OS just for music playback. I installed Arch with Xfce on top, and had to struggle for a while trying to fix several issues, including ALSA not remembering the volume level between sessions, always starting muted, and my external hard drive not mounting automatically at startup. I ended up thinking I did a bad job at configuring my system, and after trying several things, I decided to go for the lazy option and install Manjaro, in its Xfce version. I ended up having the same issues from the beginning. So I gave another lightweight environment a go: LXQT. Manjaro + LXQT ended up working perfectly, for both audio and external drives. I assume the issues were coming from the basic Xfce configuration, and even though LXQT is still in its infancy and is missing a few things (e.g. no way to turn display off when idle), it has done a great job and feels very light on my system. I recommend giving it a go! 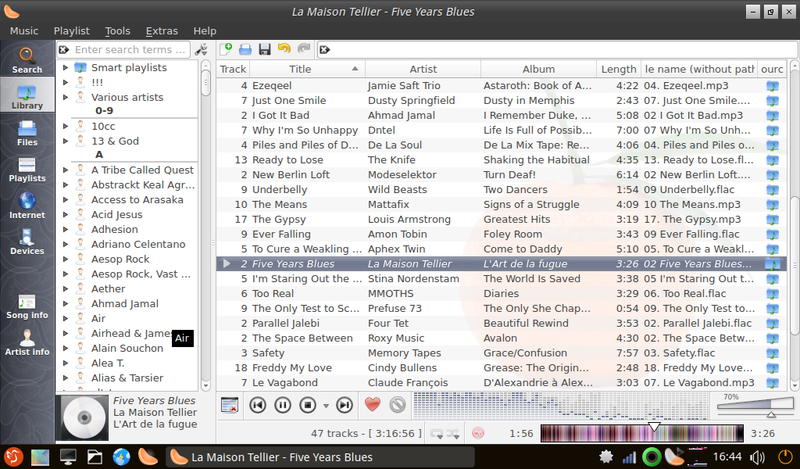 On the audio side, I noticed that Xfce uses ALSA by default, whereas LXQT uses Pulseaudio. My issues probably had a lot to do with that. It is now a pleasure to listen to music using Clementine 1.2, with Clementine Remote on my Android Fairphone!